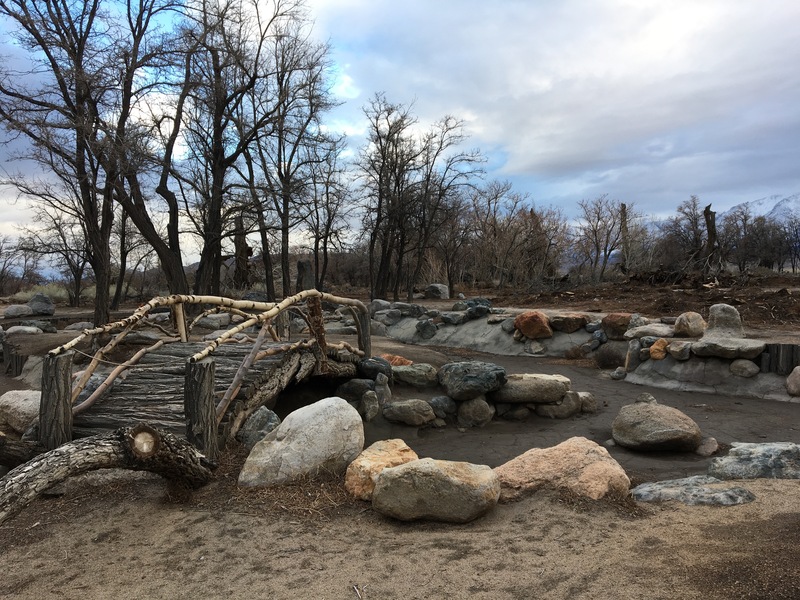 When Warren Furutani was growing up in Los Angeles in the 1950s, he sometimes heard his parents refer to a place where they once spent time — a place they called “camp.” To him “camp” meant summer camp or a YMCA camp, but this was something different. 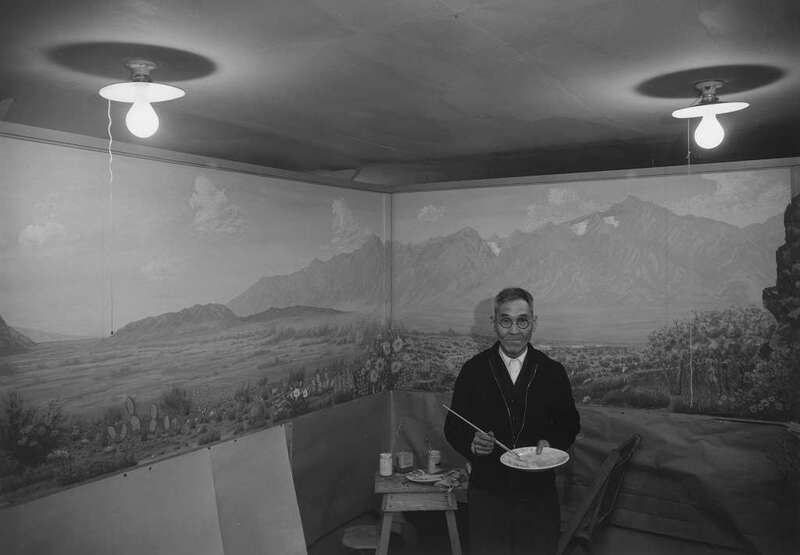 During World War II the US government incarcerated Warren Furutani’s parents, along with over 110,000 other Japanese Americans, in ten different detention centers throughout the United States. When they talked about “camp” that’s what they meant. 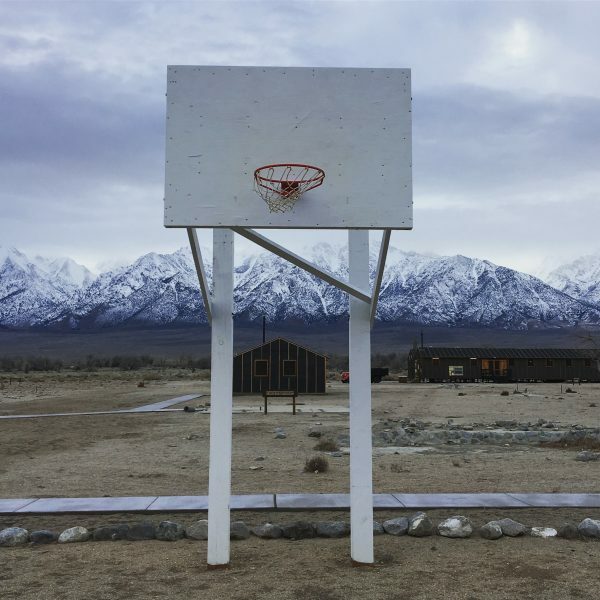 In 1969, Warren Furutani and his friend, Victor Shibata, went looking for the closest camp to Los Angeles, a place called Manzanar. It wasn’t going to be easy to find. After World War II, Manzanar had been almost completely dismantled. 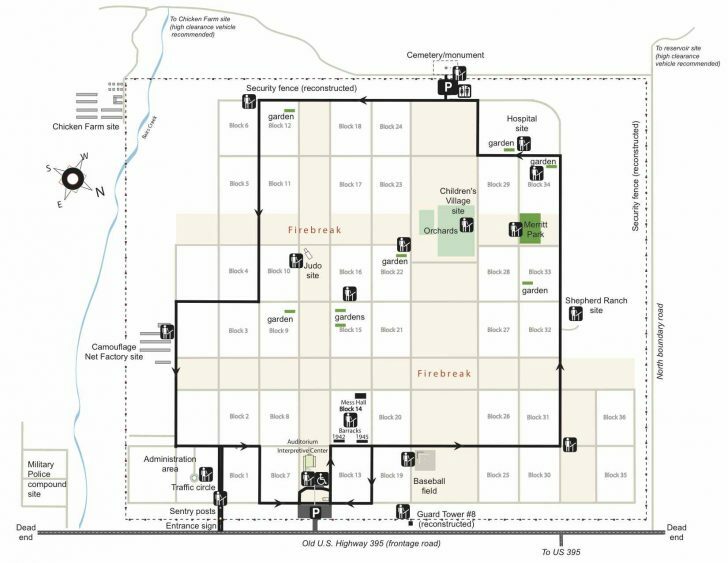 But they discovered that the camp had been located a few miles past the town of Lone Pine off route 395 in a high desert valley of the Sierra Nevada Mountains. The two men drove through the desert and eventually came across an old white pillar with Japanese lettering on it. 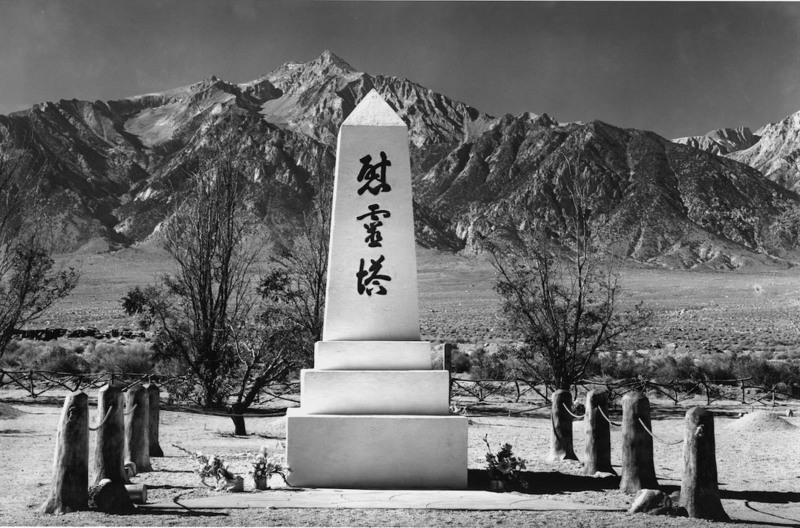 It was the original tower marking the Manzanar cemetery. They had found the remains of a camp that only a few decades earlier had imprisoned over 10,000 Japanese Americans. When Warren and Victor found Manzanar there were no books and very little information about what had happened to Japanese Americans during WWII. Manzanar itself had no historical designation and no plaque. They set out to change that. On a December morning in 1969, Warren and Victor returned with over 150 people piled into cars, vans and buses on a pilgrimage to Manzanar. 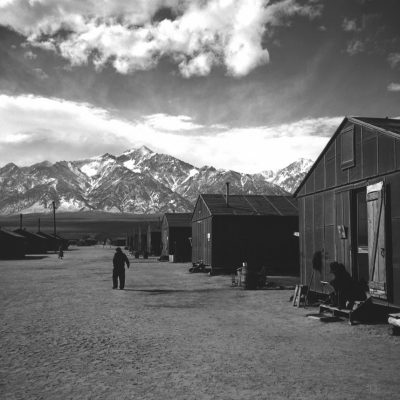 Most of the people on the pilgrimage were younger Japanese Americans who had never spent time at a camp, but there were a few people who had actually lived at Manzanar. 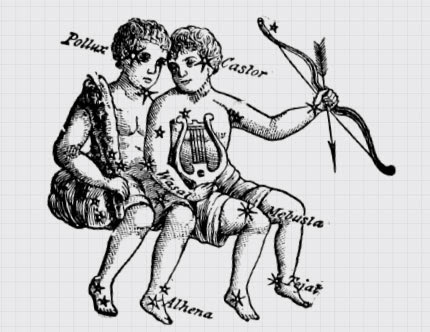 One of them was Sue Kunitomi Embrey. Sue grew up in a largely Japanese American neighborhood in Los Angeles. 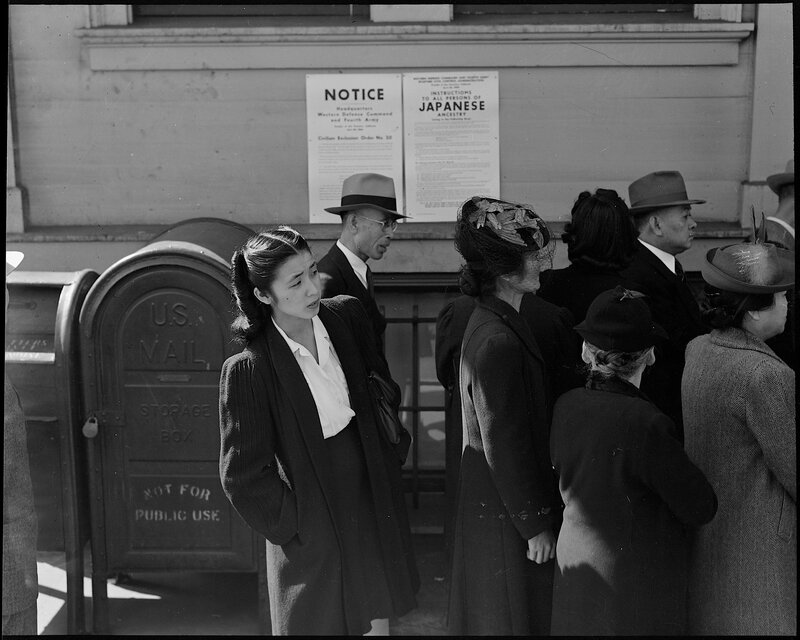 Following the bombing of Pearl Harbor, anti-Japanese racism reached a fever pitch in states like California. 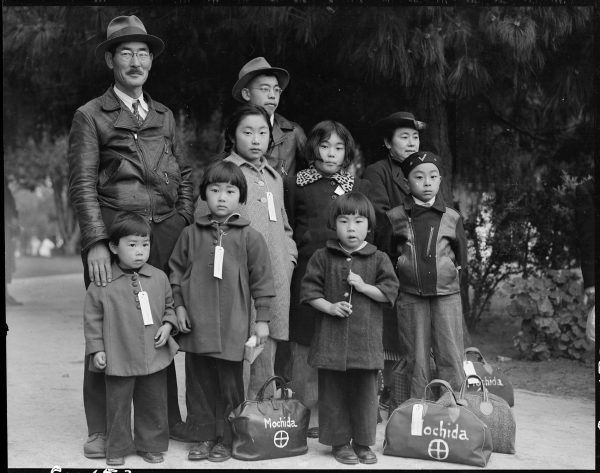 Military leaders repeatedly questioned the loyalty of all people of Japanese descent, and in May of 1942 Sue’s family received a notice from the government that they had five days to pack their most valuable belongings and report to Manzanar. 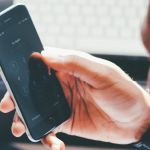 Most families had to sell property quickly, often at a fraction of its value. Some rented out their homes or left them with friends, but others abandoned them altogether. In total, there were 800 buildings and over 10,000 people packed into one square mile. 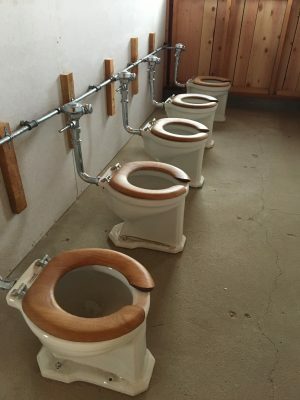 One of the hardest parts of life at camp was the total lack of privacy. The latrines were completely open and exposed, with no stalls or dividers between the showers or toilets. A five-strand barbed wire fence encircled the entire camp, with eight guard towers around the perimeter. Each guard tower had a searchlight and a soldier with a machine gun. 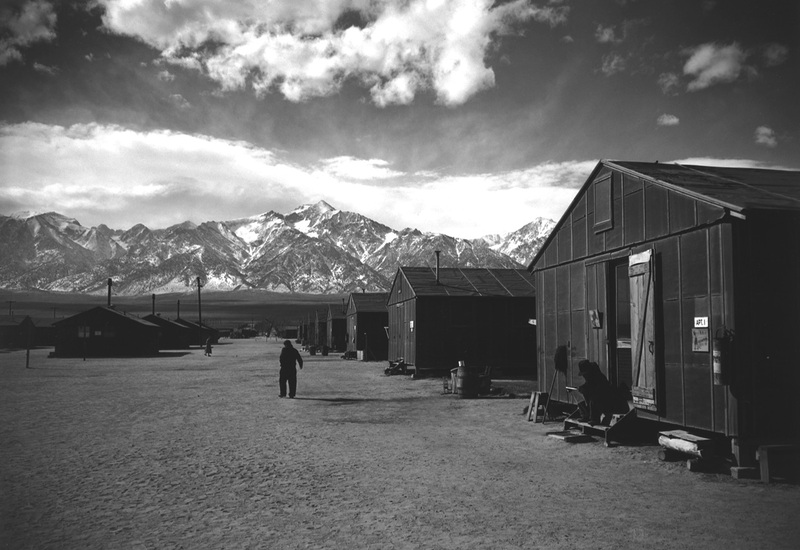 Manzanar was undoubtedly a prison, but the people inside did everything they could to turn it into a livable community. 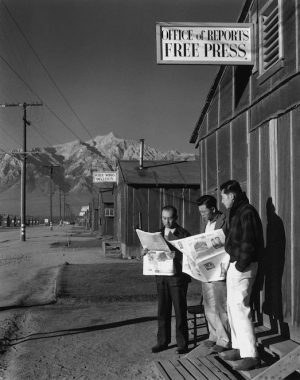 They had schools, churches and clubs, even a newspaper, ironically titled the Manzanar Free Press. 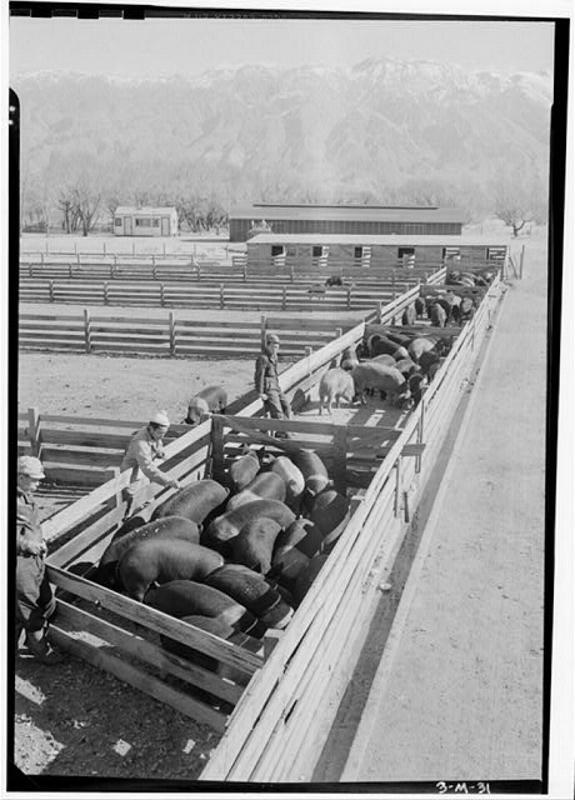 Men would sometimes sneak under the fence to go trout fishing in nearby streams. People built rock gardens and planted flowers and vegetables. 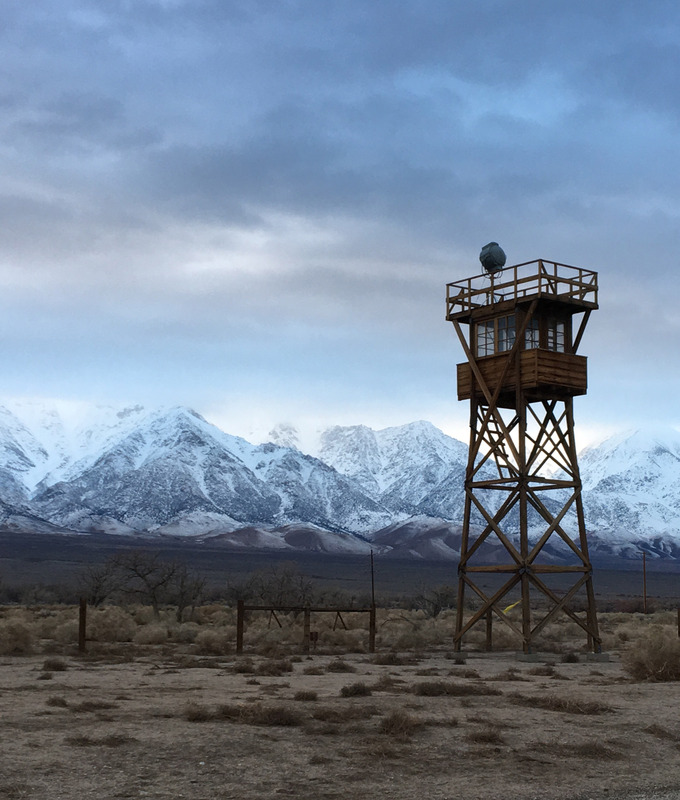 On November 21, 1945, a few months after the US bombed Hiroshima and Nagasaki, and nearly four years after the camp had first opened, the government closed Manzanar for good, and dismantled the camp. After Sue Kunitomi Embrey left the camp she moved to the Midwest for a little while, but ultimately ended up back in Los Angeles. More than twenty years later, when she heard about a bunch of young college students making a pilgrimage to Manzanar, she decided to join them. 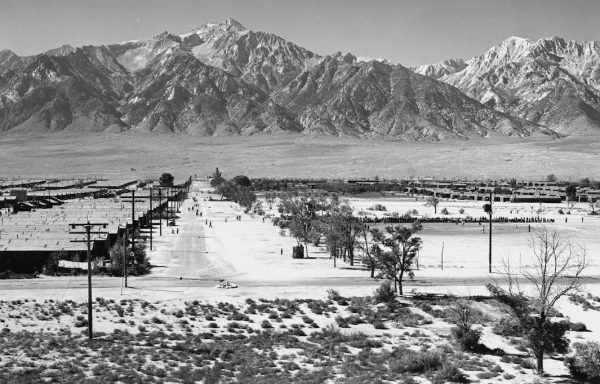 Following the 1969 pilgrimage, Sue Embrey, Warren Furutani and others formed the Manzanar Committee, with the goal of getting the site recognized as an historic landmark. They lobbied hard for three years, all the while continuing yearly pilgrimages to the site. 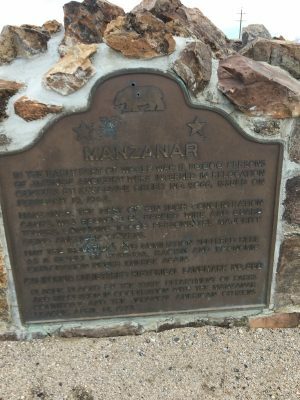 In 1972 the state of California designated Manzanar a state landmark and agreed to install a bronze plaque. It was one of the first public acknowledgements of what had happened there during the war. 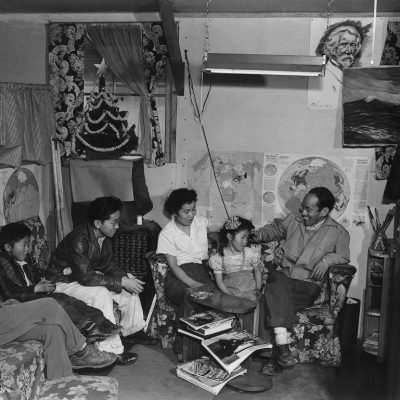 But the Manzanar Committee was undeterred. They wanted to get the camp designated as a National Historic Site. 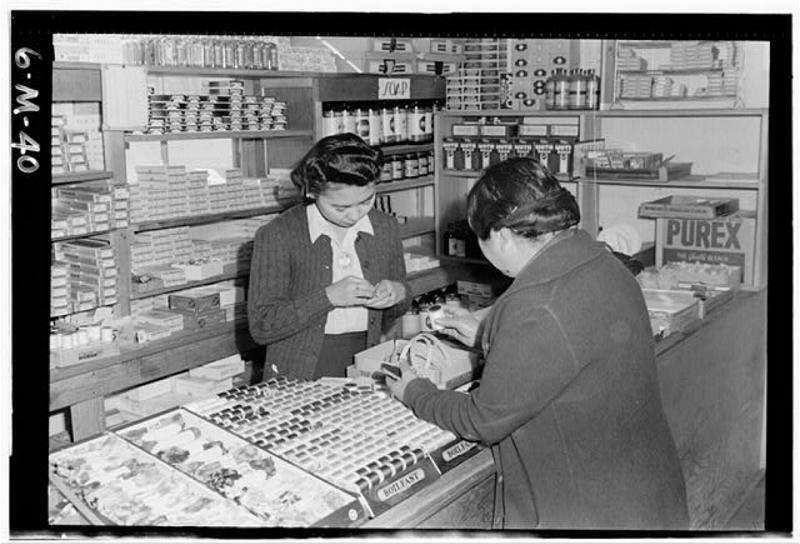 After decades of activism and lobbying, the Manzanar Committee ended up drafting legislation for Congress. 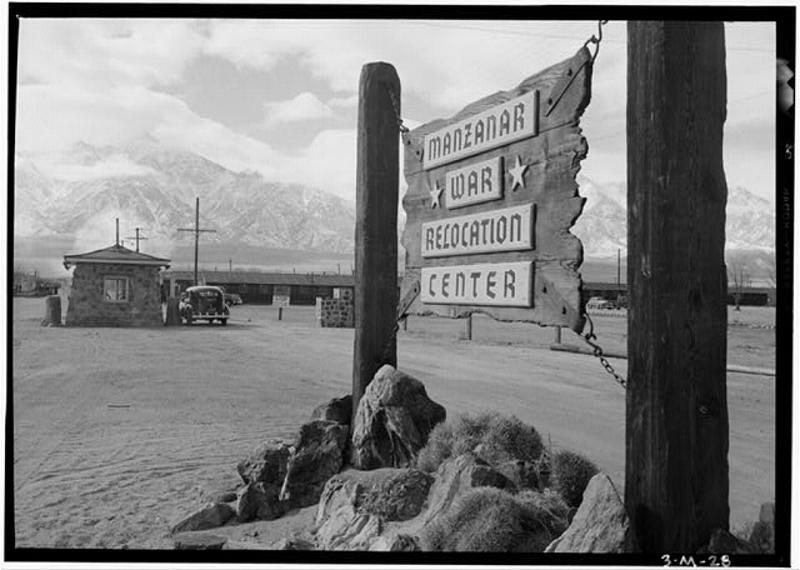 The legislation passed and in 1992 Manzanar was declared a National Historic Site. But apart from the cemetery, there was little there. 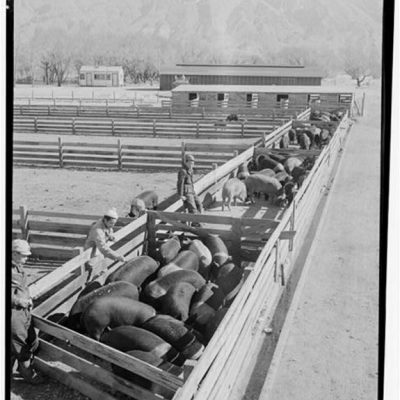 The committee did not want to settle for a staid, sterile museum and so they worked with the National Park Service to rebuild portions of the camp exactly as they had been during the war. Near the visitors’ center there is a rebuilt barrack, guard tower and lone basketball hoop. One can also drive around the grounds, following a one-way road that traces a long and winding circuit through what used to be the camp. Signposts along the way show where specific buildings once stood. In some places, cracked concrete foundations and the remains of rock gardens have been unearthed or rebuilt. But the most powerful symbol might be the site’s newest addition, a replica of the women’s latrine with a trough sink and row of five toilets with no dividers between them. 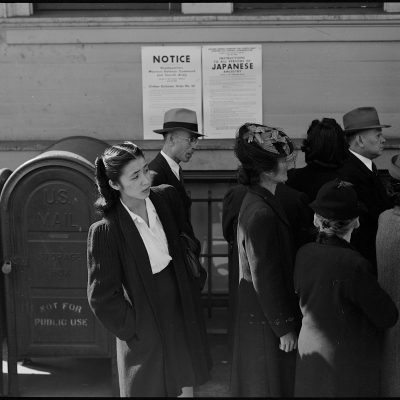 It’s a stark reminder of the humiliation felt by many Japanese Americans during their incarceration. Alisa Lynch is the head of historical interpretation at the site. She has spoken to hundreds of people who were incarcerated at Manzanar, and they all have different stories about life at camp. She just wants the site to tell the full, messy history of what happened there. 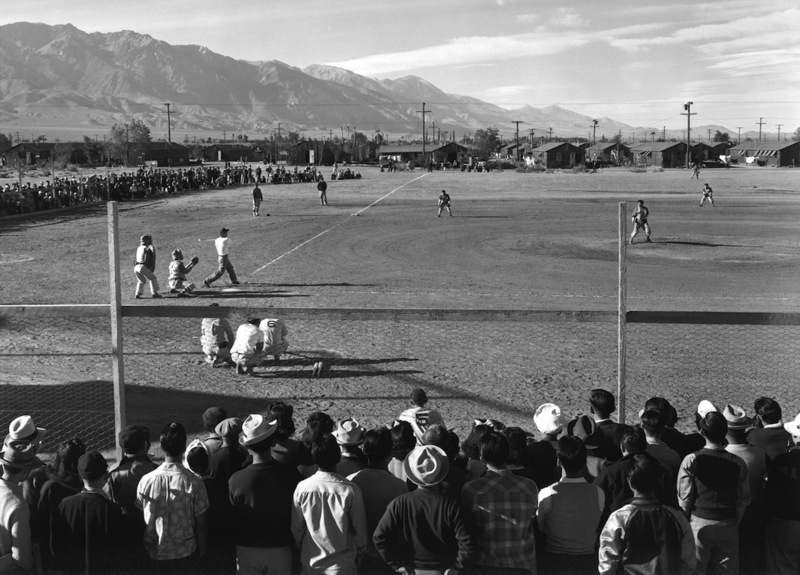 The Manzanar committee continues to host the annual pilgrimage, and every Spring hundreds if not thousands of people journey to the site. It’s not just Japanese Americans. Since 9/11, there has almost always been a speaker from the Muslim community. The activists who lead the pilgrimage want to connect connect the history of wartime discrimination against Japanese Americans with contemporary discrimination against Muslim Americans in the name of security. Organizers believe that this year’s annual pilgrimage on April 29th, 2017 may be the biggest one yet. 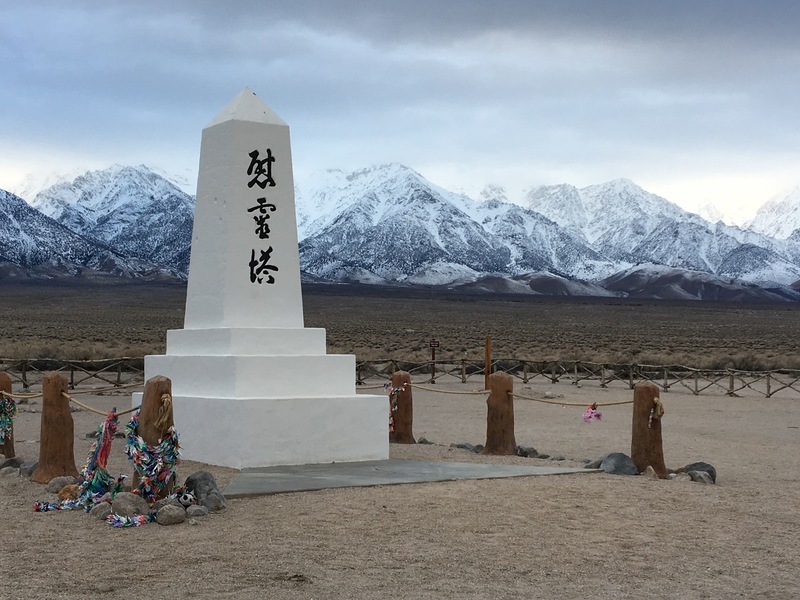 Visit the Manzanar Committee pilgrimage page to learn more. 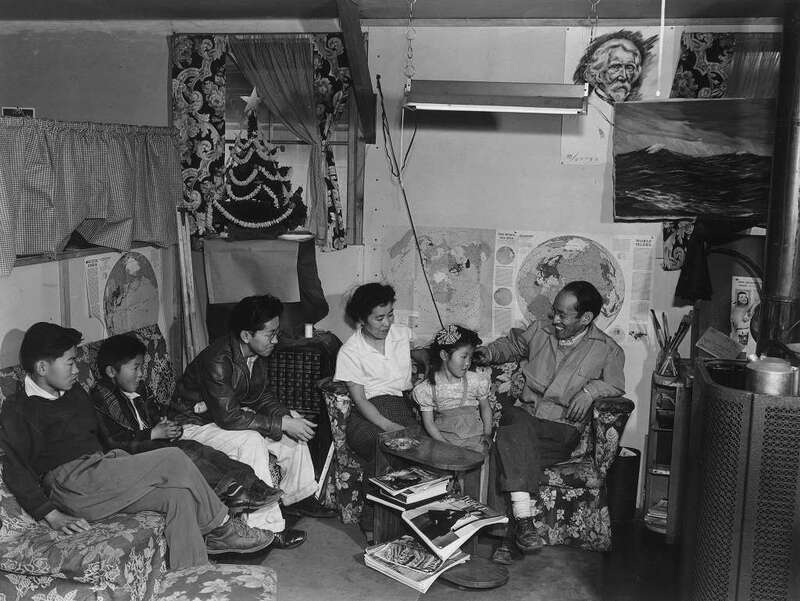 Producer Emmett FitzGerald spoke with Los Angeles activist and politician Warren Furutani; Bruce Embrey current co-chair of the Manzanar Committee and son of Manzanar Committee co-founder Sue Embrey who passed away in 2006; and Alisa Lynch, head of historical interpretation at the Manzanar National Historic Site. 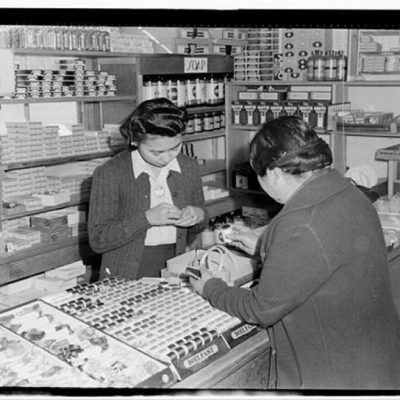 Audio of Sue Embrey comes from an oral history in the archive of Densho: the Japanese American Legacy Project. More images of the internment process and Manzanar by Ansel Adams and Dorothea Lange can be found via the Library of Congress and National Park Service. Presently, there is an exhibition of photographs by Ansel Adams and Leonard Frank at the Crocker Art Museum in Sacramento. It was quite interesting. Great episode! 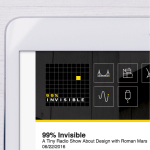 I love how 99% Invisible is discussing the design of social justice issues! The Sanctuary episodes were great as well! As a Japanese American college student, I have helped organize pilgrimages to Manzanar for the last two years. We bring college students, former WWII internees, Muslim American activists, Buddhist priests, and community organizers to the site. 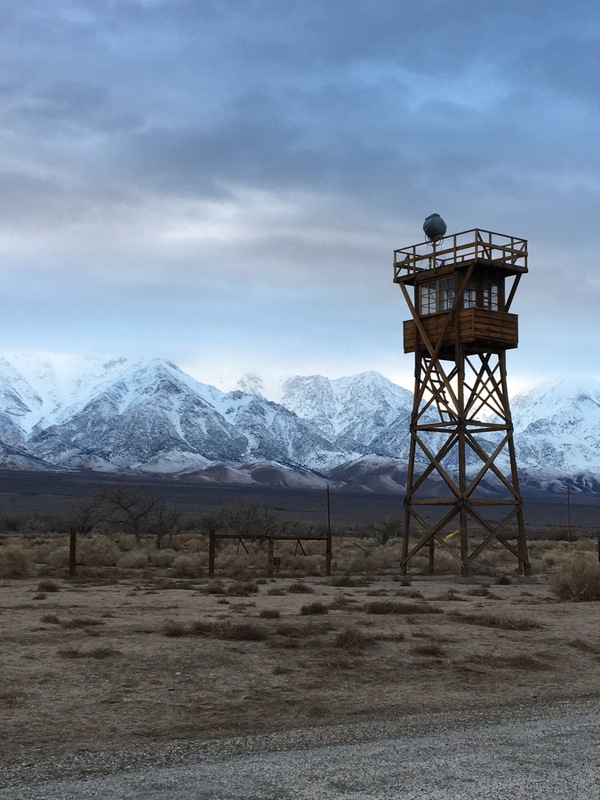 When we arrive at Manzanar, the site is literally where we find common ground. Through walking the same worn paths and seeing the barbed wire fence in the same place as it was 75 years ago, we share an experience, build lasting friendships, and reaffirm the need to protect civil rights for all Americans regardless of religion or national origin. I love 99% Invisible! Keep up the great work! 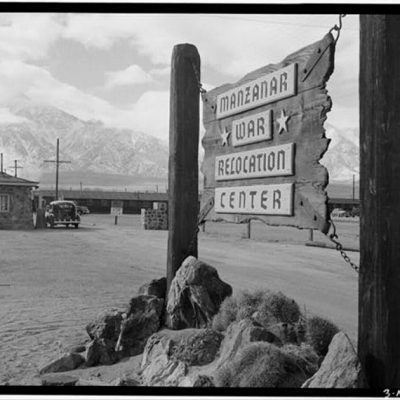 As i was listening to this episode, I kept thinking that I have heard of this place Manzanar. “Where have I heard of this place?” I kept asking myself. In my head, I could hear someone say “Man-zan-ar Re-location Center” in a very slow and distinct voice. Where have I heard this!!!! Then it finally dawned on me! The movie “Karate Kid” (old version) with Ralph Macchio. Daniel is going through Mr. Miyagi’s (played by Pat Morita) memory box, when he comes across a letter. He reads aloud that Mr. Miyagi’s wife and child died at the Manzanar Relocation Center due to complications arising from child birth. As Mr. Miyagi was a soldier fighting in the war, his pregnant wife was in this forced relocation center. This is a dimension to the movies plot that I simply did not understand when I watched the movie as a kid. 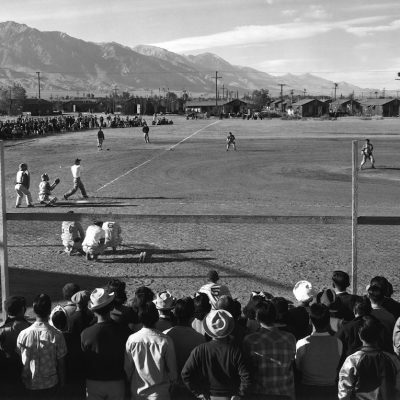 And the movie really didn’t do anything to explain the significance of what had taken place at Manzanar Relocation Center. Yet it adds a further tragedy to the story. Thanks for this sad but illuminating story. It’s so horrible that this event happened. And how shameful that no one spoke up against something that is both unethical and unconstitutional. But it’s so much more horrible and shameful that this is a timely podcast that applies to current politics when the United States is on the verge of repeating the mistakes of the past. 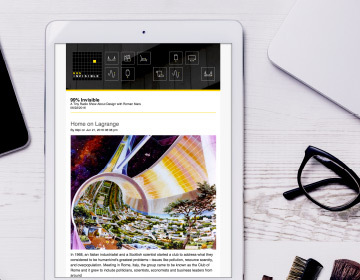 This podcast is showing that you can do more than educate, you can change the world. I loved the Sanctuary episodes and I love this one too. Keep it up. It’s not just Japanese Americans. 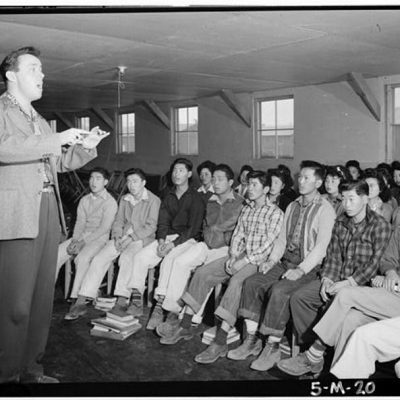 Many Alaska Native people were imprisoned in similar camps. After the war the men were ‘released’ first, ostensibly to rebuild their homes and villages which had been substantially​ damaged by soldiers stationed in the Aleutian Islands before their families returned to the villages. In fact, they were enslaved by the us military. With their families held hostage in the camps, the men were forced to hunt and slaughter fur seals by the thousands for their pelts to secure the returns​ of their loved ones. This was a timely and well done story that could apply to any of the other 9 camps where Japanese Americans were incarcerated. My mother was in Rowher, Arkansas, in a swamp. Quite a change from Los Angeles. The experience was degrading and shameful, and it haunted her for the rest of her life. 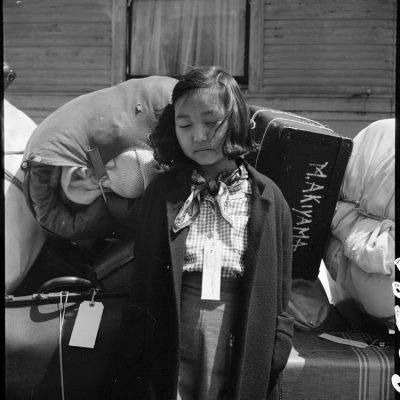 I think another story worth your time would be about Ansel Adams, Dorothea Lange and other photographers who were hired by the War Relocation Authority to document life in the camps. 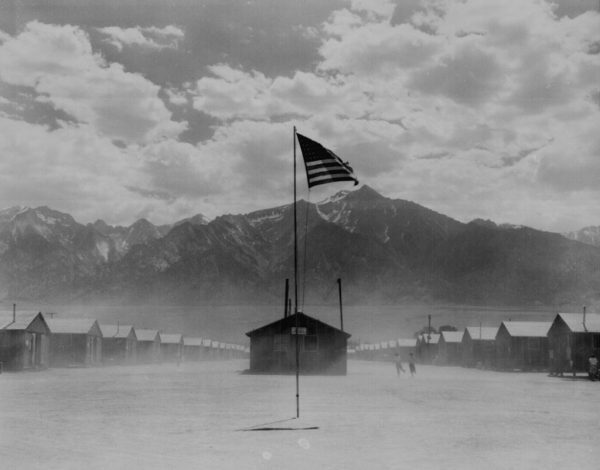 The WRA wanted propaganda photos showing how comfortable the camps were and how the internees were treated well. Once they saw the photos, they impounded them and wouldn’t allow publication because conditions were so grim. Great episode – would have been interesting to hear some discussion about landscape modernist icon Garrett Eckbo’s contribution to the site in master planning the staff quarters and designing amenities for the guards. 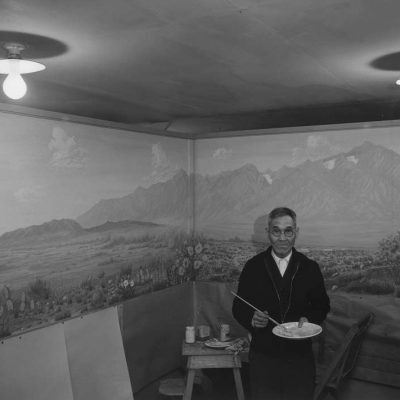 Architects had a hand in the tragedy of Manzanar as well. I’m guessing this could very well happen again if the US engage in major war with another nation. Like China? Russia? Middle East countries? 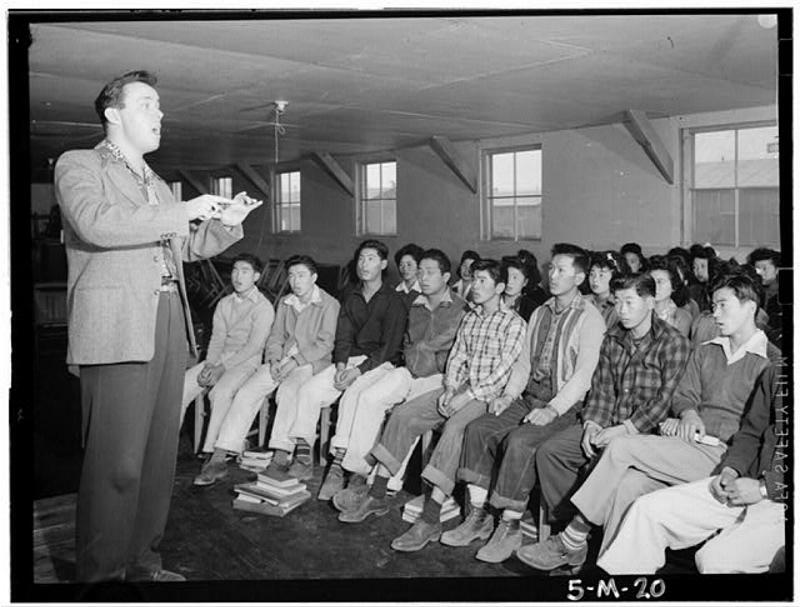 Towards the end of this podcast your narrator states that ‘in recent years the activists who lead the pilgrimage have tried to connect the wartime discrimination against Japanese Americans with contemporary discrimination against Muslim Americans in the name of security’. That seems like an admirable aim to me, however, this narration is misleadingly inter-cut with one of your interviewees, who immediately afterwards goes on to refer to ‘…America embarking on some of this same non productive racist behaviour’, whilst referencing the modern day Muslims you refer to. This is disingenuous on your part as this statement goes unchallenged, perpetuating the myth that Islam is a race, which it clearly is not; anything you can convert from or to is clearly an ideology and not a race. Criticising the worst excesses of the Islam, and societies based on that ideology, does not make a person a racist, or someone that discriminates against Muslims, who are a group of people affiliated with the ideology of Islam. Sadly, in recent years, it has become all too common for left wing political extremists to disingenuously slander people with the term ‘racist’ merely in order to poison the well and shut down legitimate discussion of the worst excesses of Islam. In the main I enjoy your intelligent and well researched podcast. However, by embarking on clumsy, disingenuous, partisan rhetoric such as this you diminish your product and yourselves.